What inspired me to devote my life to music? That's a question musicians do sometimes get asked, and I find it impossible to answer. My father, certainly, and the fact that both my parents were supportive in getting all four of us children to learn the piano. That first piano teacher, Elizabeth James, who was both inspirational and brilliant, and whose legacy remains with me to this day, sadly unthanked or generally unappreciated. And certainly a memorable performance of The Wasps Overture by Vaughan Williams in the Royal Festival Hall in London sometime in the early 1960s (I remember sitting back in my chair, putting my head back on the seat cushions - they seemed so large then - and giving myself up to some fabulous horn playing in a performance which, I have a feeling, was conducted by Sir John Barbirolli). But perhaps the strongest debt I have is to Barry Rose who was the choirmaster at Guildford Cathedral. I did not sing in his choir on a regular basis, but whenever I came under his direction, it was a moment of such inspirational glory, that I carried it with me for years. In short, I admired him almost to the point of hero-worship, and when he moved to St Pauls, I never let a month go by without turning up for a weekday evensong (even though, by that stage, I was living in Ireland with a cathedral choir or my own to direct). Sadly, the idea of church music as something to treasure and nurture with care, love and consummate quality seems to have gone by the board. Why offer God the very best when we can make do with the cheap and nasty? Why train a choir and organist to heights of perfection, when with a few wires, speakers and wannabe (but grotesquely untalented) rock-musicians we can relive in glorious musical monochrome the poorest moments of historic Eurovision Song Contests. When I walk into a church and see a drum kit, music stands and amplifiers, I walk out and seek God in the nearest pub. Organists only have themselves to blame for this. Their incestuous fascination with the technical intricacies of their instruments, their exclusive attitude to their instrument and their acceptance of the fifth rate in music simply because it is French 19th century, north German 18th century or uses the Tuba Mirabilis 8 foot, has alienated so many (notably priests and vicars) that their demise is, lemming-like, self propelled. My old friend and fellow-chorister, Peter Almond, rooted out from the internet (he's retired, not as mobile as he once was, and lives alone in glorious south London splendour, so he has time to trawl through the dark recesses of the web) a recording of Barry Rose and the Guildford Choir at their very heyday. And, despite pressure of work, a pile of CDs to review, and an impending appointment at the hospital, I've given myself up to wallow in the glories of the past. And I've come up with something I should have said years ago. The Golden Age of British music may have been encapsulated in Gibbons, Tallis and Purcell. It may have belonged to Britten and Walton, Vaughan Williams and Elgar. But for me, it was the Anglican cathedral and church music of the 1960s-70s when cathedral organists were, for a very brief time in their long history, also consummate musicians, inspirational choir trainers and devoted servers of the church. I do not find such people exist today. 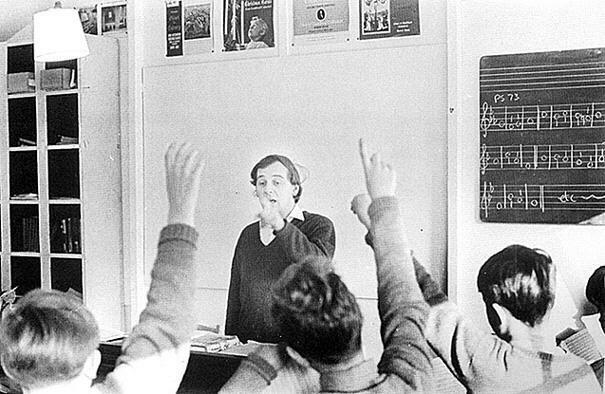 The Philharmonic Chamber Choir had the honour of working with Gregory Rose in its early years.